Mathematics is a man of many talents, throughout a career in music spanning almost 30 years he has made his mark on the hip-hop game as a producer, a DJ and a graphic artist. There from the groups’ very origins, Mathematics has been a long time affiliate of the Wu-Tang Clan, from DJing for GZA in the early 90s to producing seminal Wu records such as Ghosftace - ‘Mighty Healthy’ and Wu-Tang Clan - ‘Rules’. 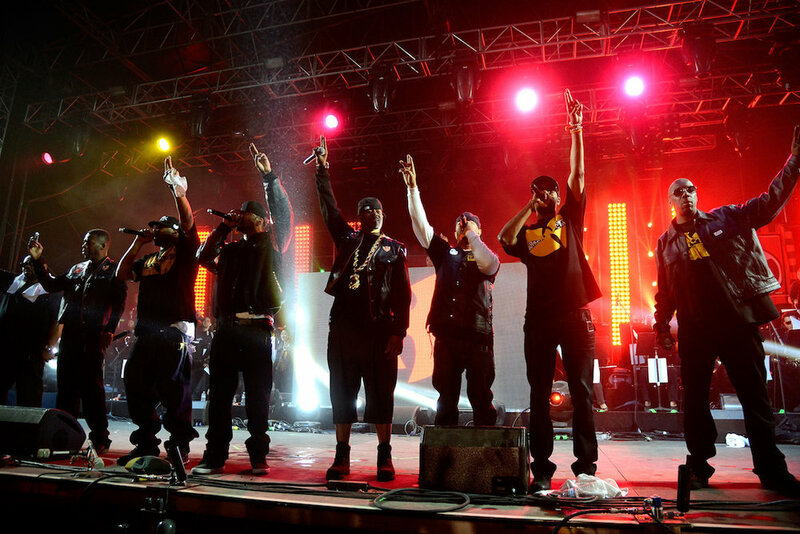 Mathematics has recently produced the entirety of the new Wu-Tang album, ‘The Saga Continues’, bringing a new yet authentic sound to the project. We chat to him about the new album, his origins as a producer, his artwork and more, Victor McMillan writes. 1. ‘The Saga Continues’ has been very well received since its release, how was the recording process for this album different from the earlier years of Wu-Tang, does the same energy still exist? Oh yeah The Deuce, he’s killin that. He’s a dope actor too. You produced the entire album, did that happen organically or was it more of a conscious decision? “Kind of both. At the end of ‘A Better Tomorrow’ RZA actually came to me and said I think you should produce the next Wu-Tang album, so when he said it I was kinda like ah I don’t know about that (laughs), it’s like a little overwhelming, you know, I didn’t think I was ready at the time but then it’s just something that happened naturally. Because I’m making the music and working harder and putting things together it all came together. RZA listened to some of it and said ‘Yo this sound like that Wu’ nah mean. You began your career in music as a DJ, how did you then transition into production? “I transitioned into production in 95, it was actually the same thing that got me into DJing, it happened the same way. I was young when I started DJing and I was going to a lot of Park Jams. I was seeing a lot but there was this one particular jam I went to at PS40 at the 40 Projects and Grandmasta Vic was rockin, I was there at the front of the rope and I could really see him getting busy and that’s what made me want to be a DJ. As far as being a producer I remember when RZA was working on the Cuban Linx album and he took a break, I remember we went to the movies and when we came back he started working and by the time he finished, the track he was working on was ‘Ice Cream’. That track right there, when I heard it booming out the speakers I was like ‘Yo, what is this? What you make this on? And he said the ASR’ so I went and copped me one and the rest is history, I became a producer after that. A lot of people don’t know but you were behind the design of the Wu-Tang Logo, how did that come about? “That came about because, you know, I did graffiti as well. RZA knew I did graffiti so I originally did RZA’s first stickers when he was on Tommy Boy, he had that song ‘Ooh We Love You Rakeem’ and he wanted some stickers. From there the Wu-Tang stickers came about, an idea he had for a long time. Basically I thought he would’ve wanted a name or something but he’s like “Nah gimme Wu-Tang” and I thought yeah Wu-Tang, that’s dope, I love the Karate flicks as well. At that time brothers was using Wu-Tang as a slang in Staten Island and to my knowledge it’s something that RZA started so if something was dope it was Wu-Tang, like “that’s Wu-Tang right there”, that’s where it started from. From there it really came down to crunch time when RZA was getting some things printed up and he hit me one day like I need a logo, but I need it tomorrow though (laughs) so I put it together for him one night, he got it, and the rest is history. Is drawing or designing artwork something you still do today? “Not really, my time is more occupied with music, I’ve drawn a little bit not too long ago to see if I still had it, and I’ve still got it. On this project right here, The Saga Continues, I had artists come in and do the artwork for that, and it’s probably something I could’ve done myself I’m sure but I was so focused on the music. I got Gano who’s a dope graffiti artist and he brought on Serve, another cat, and this other cat out of Chicago too. It was a collaboration between them and me giving my ideas, and they put it together. Aside from your solo projects, which Wu-Tang Albums (either solo or group) do you think are underrated? “That’s a hard one, it’s kind of hard for me to say because of some hard-core Wu-Tang fans, it’s like even if one person might feel like ‘that album was just aight’ another Wu-Tang fan would be like ‘is you crazy? That album was bangin’ (laughs) nah mean. Uncontrolled Substance I think is underrated, that was a dope album, T2 too, I think that was underrated as well.